Ok, so I know I’ve been talking about peach-flavored drinks a bit much lately (what with the Naked Navel and all), but I’ve got to fit just one more in. You see, I just returned from Atlanta and I’ve got Georgia on my mind. And despite the fact that the #1 peach-producing state in the nation is actually South Carolina (a disappointing fact I learned this week) there is no place more synonymous with that fuzzy little fruit than Georgia. I met a liquor store owner named Bubba who talked about a recent Toby Keith concert for about 45 minutes. The TGI Fridays I visited had a “No Guns Allowed” sign on the front door. Giggles aside, Atlanta was a great city—sprawled out with more green spaces than is typical in major U.S. cities. Everyone I met was friendly and helpful and I had a great time. This drink was inspired by my trip—the peach because it’s Georgia, the blackberries because I had some great ones in a parfait Monday morning, the almond flavor because my Austrian friend, Liz, gave me Mozart chocolate balls with marzipan, and the rum because…well…I just like rum. Here it is—hope you enjoy it as much as I did! Muddle the fresh Blackberries in the bottom of a cocktail shaker. Add the Rum, Crème de Noyaux, and Peach Juice and stir well. Strain into a highball glass filled with crushed ice. Garnish with a Peach slice and sprig of Mint. The “Fuzzy Navel,” as we know it today was created by our dear friend Ray Foley, and rose to fame in the 1980’s. Its great popularity was due, in part, to its catchy lil’ name and the fact that it’s sweet, easy to make, and features the great pairing of peach and orange flavors. What followed soon after were a few variations to this very simple drink—including the Hairy Navel (add vodka) and the Fuzzy Pucker (sub grapefruit juice for orange). Now there’s a new navel on the market—“The Naked Navel,” featuring Hiram Walker’s White Peach Schnapps. With a slightly lighter taste, the use of Hiram Walker White Peach Schnapps gives the drink a more delicate, clean, crisp feel. Continuing with the “Navel” theme, they’ve also got recipes for a “Pierced Navel” (with 100 proof vodka) and a “Barbed Navel” (with Agave Tequila). Muddle the mint leaves in a Collins glass until the essence is released. Add ice to fill the glass. Add lime juice, Rum, and Schnapps. Pour into shaker and pour back into glass. 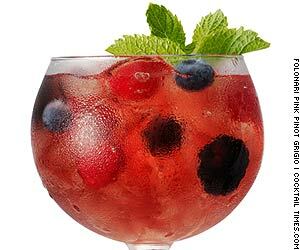 Add two thin straws and garnish with a mint leaf. Fill a hurricane glass with ice. Pour ingredients as listed. Pour back and forth in shaker two times to mix and top with Lemon Lime Soda. Combine ingredients in a blender. Blend until smooth. Pour into a hurricane glass, garnish with a lemon corkscrew and mint sprig and serve. What’s your favorite summer drink? Share it here & don’t be ashamed if it seems silly or simple. Who doesn’t love a nice, sickly-sweet frozen Pina Colada every now and then?